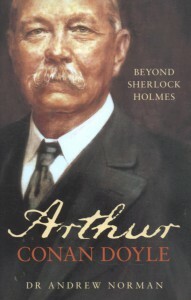 Arthur Conan Doyle - Beyond Sherlock Holmes, Andrew Norman's biography of Arthur Conan Doyle is one of those books that got off to a rocky start with me and I should have DNF'd after the Preface. However, I wanted to know how preposterous the book could actually get, or, ever so hopeful, if the premise set forth in the Preface was just an unlucky and sensationalist choice of "bait" that would be abandoned in the course of Norman's investigation of ACD's life. As I don't want to string anyone along, the book did not improve after page 11, which is where the Preface ended. In fact, if anything it got worse. So, if you plan to read on this short collection of thoughts about Norman's biography of ACD, you're in for a bit of a rant. Not only that, but this illness was itself a hereditable disease, in other words, one which Charles may have handed down to his son via the genes. Suddenly I realised that I now had an opportunity to solve what I consider to be the ultimate mystery, that of the bizarre and extraordinary nature of Sir Arthur Conan Doyle himself." This was the in Preface! I don't know about other readers, but unless I am reading an academic text where the expectation is that the conclusion is summarised in the prefacing abstract, I am not looking to have the author's assumptions stated as facts on page 11 (!) of what I would hope to be a gripping biography of an extraordinary personality. Next we get two (yes, TWO!) short chapters on Doyle's childhood, which are mostly pre-occupied with his the difficulties that his family had to cope with - mostly his father's alcoholism. There is, in fact, little about young Arthur in these chapters. Following this we get no less than ten (TEN!) chapters about Sherlock Holmes. Not just about the writing and publication of the Sherlock Holmes stories but actual interpretation of Sherlock as a character - all substantiated with apparently randomly selected quotes from the different stories. Seriously? A book that carries the subtitle of "Beyond Sherlock Holmes" should not focus on the one topic that the subtitle seems to exclude. What is more, there are only 25 chapters in this book in total. Norman has spent 10 of them on Holmes. That is preposterous. Unfortunately, there is nothing new or detailed in this, and the focus and ACD is superficial. Norman uses these chapters to write about ACD's father's illness and time in various mental institutions, surmising at what kind of psychiatric condition he suffered from. This, however, can only be guesswork on Norman's part. Charles Conan Doyle was hospitalised privately. There are few actual medical records. What is more,even if there had been medical records, the areas of psychiatry and medical treatment of addiction or mental illness in the 1890s was still in its infancy. The recording and diagnosis of cases of people who had been hospitalised or committed can hardly be described as reliable. And yet, Norman, with the help of The Shorter Oxford Textbook of Psychiatry (by Michael Gelder, Paul Harrison, and Philip Cohen) dares to presume to make a diagnosis of what illness may have plagued Charles Conan Doyle, and has the audacity to infer that Arthur Conan Doyle may have inherited the same potential for mental illness because in one of his works he wrote that he knew, rather than believed, that fairies existed! And, btw, I kid you not, but the The Shorter Oxford Textbook of Psychiatry is referenced throughout the relevant chapters as the ONLY source to back-up Norman's ideas. Never mind that spiritualism was an actual thing in the early 1900s and that ACD was not alone in believing in fairies and magic and the paranormal. Instead of investigating ACD's interest, Norman's work in this book is not just superficial but outright lazy. He simply regurgitates the same outrage and disbelief over how a man of sound mind can belive in something fantastic. With this book, Norman simply jumps on the gravy train of sensationalism and continues an outcry over the notion that an author of fiction may have believed in something other than hard facts. Seriously, I have no idea what Norman's other books are like, but he seems to have written several other biographies featuring Charles Darwin, Agatha Christie, Robert Mugabe (seriously??? ), and others.